I met Nancy Sanders, a talented children’s author, two years ago, through the popular 32 Authors Online Scavenger Hunt. We have since become friends and she has been a source of advice and even comfort in the difficult times of my life. At that time, I noticed she had written several interesting books for Chicago Review Press. Two titles were for their “For Kids” series of biographies, whose format seemed very similar to that of my Christian Biographies for Young Readers. I contacted the editors to see if they were interested in a title. Originally, I wanted to write a book on the Protestant Reformation, in view of the 2017 anniversary of Luther’s 95 Theses. They didn’t accept my proposal, but told me they had been looking for someone willing to write a book on Michelangelo. Immediately, I saw many advantages in writing such a book. 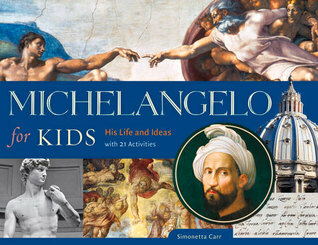 Michelangelo was Italian (so I could read his original writings), he lived during a time period I have researched in depth, and his works have an amazing depth that can enrich the lives of children. Also, I had a burning desire to present the Protestant Reformation and Roman Catholic response with clarity and accuracy. On the other hand, I had to take many factors into consideration. First of all, art books require many images which are normally very expensive. Second, I have normally been writing for Christian families who may in some cases object to images of God and Christ, or to images of the naked body (like the David). On the other hand, you can’t talk about Michelangelo without showing those images. I sought counsel from my pastors (Rev. Michael Brown and Dr. Rev. Michael Horton), who encouraged me to pursue this project, especially since it practically fell on my lap. You can’t teach children art history without incurring in images of God and Christ, or occasional nudes. Parents can avoid this subject altogether, or use judgment and wisdom in guiding the children in this field of learning. Overall, I think this book will be useful to many children and families.